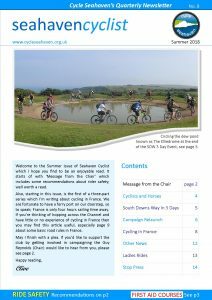 The Winter issue of our quarterly newsletter ‘Seahaven Cyclist’ has been emailed to all members. It’s another bumper issue, this time 25 pages, which includes articles covering a wide range of topics of interest to Cycle Seahaven members. These include the experiences of a member who did a charity cycle ride in India, an article about Roberts Frames near Hailsham, another about how someone became a ride leader and an article about the joys of Friston Forest night riding. Plus, there are the regular features: Ladies Rides, Touring Rides, Dr Bike, Treasurer & Membership Secretary News and, of course, A Message from the Chair. Also, there’s an update on Cycling Without Age (Seaford Chapter) and notices about the forthcoming AGM, a social event in February and E-Bikes. It all makes for an enjoyable and informative read. As an experiment, this issue has been produced in landscape rather than portrait orientation. This should mean less scrolling by those who read it on the wide screens of laptops and PCs; it probably doesn’t make much difference on tablets. I’d very much welcome feedback from members, in particular, which orientation is preferred and the type of devices on which the newsletter is read. I can be contacted through our Ride Leader Contact page. I’ll publish a summary of the feedback in the Spring issue. 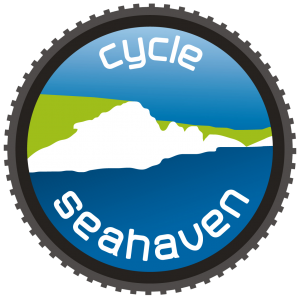 The Autumn issue of our quarterly newsletter ‘Seahaven Cyclist’ has been emailed to all members. 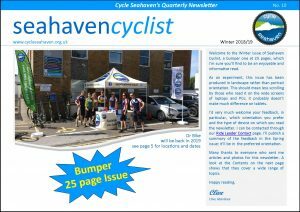 It’s a bumper issue of 21 pages which includes articles covering a wide range of topics of interest to Cycle Seahaven members so makes for an enjoyable and informative read. The summer issue of our quarterly newsletter has been emailed to all members. 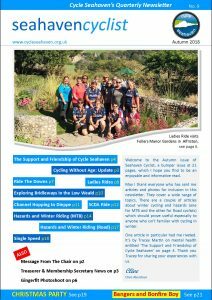 It’s a 14-page issue, more pages than usual, which includes articles ranging from cycling in France to the South Downs Way plus articles on Ladies rides, a campaign relaunch etc, as well as a message from the Chair (Guy Reynolds). If you haven’t received the newsletter then please contact Denis Bass (Treasurer) who will send you a copy. He can be contacted through the Contact Us page on the website.